Asia’s vultures have undergone a catastrophic decline through exposure to a toxic veterinary drug. In Nepal, an intensive recovery programme is establishing safe feeding sites—known as vulture ‘restaurants’. Although much work remains to be done, the initiative offers hope for the future of these magnificent birds and provides a model for the conservation of vultures throughout the region. Vultures are keystone species that perform a vital ecosystem service by disposing of carrion. They are also culturally important, being central to the Buddhist funerary practice—known as ‘sky burial’—wherein human corpses are placed in the open to be consumed by scavenging animals. In the early 1990s, vultures were still a common sight in the skies above South Asia. However, within a decade their numbers had plummeted and several species were on the brink of extinction. In Nepal, numbers of White-rumped Vulture Gyps bengalensis dropped by more than 90% (Shultz et al. 2004). Similarly precipitous declines were recorded for Slender-billed Vulture G. tenuirostris and Red-headed Vulture Sarcogyps calvus. Today, all three species are considered Critically Endangered. Research has identified the cause of the decline to be diclofenac, a veterinary drug used to treat livestock (Oaks et al. 2004, Shultz et al. 2004). 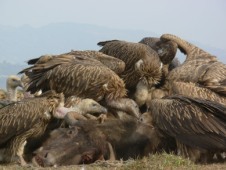 Vultures feeding on the carcasses of animals recently treated with the drug suffer renal failure and die (Green et al. 2004). The Nepalese Government and Bird Conservation Nepal (BCN, BirdLife in Nepal) have been central to efforts to save Asia’s imperilled vultures. 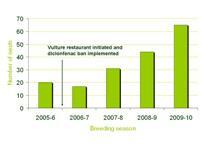 In 2006, a ban was introduced on the production and importation of diclofenac for veterinary use. Pharmaceutical firms are encouraged to promote a safe alternative called meloxicam (Swan et al. 2006). The use of diclofenac has since declined by 90% across parts of Nepal; however, its complete elimination from the scavenger food chain has yet to be achieved (Gilbert et al. 2007). In 2007, BCN established the first community-managed Vulture Safe Zone at Pithauli in Nawalparasi district. Within this area, safe, diclofenac-free carrion is provided at feeding stations known as ‘vulture restaurants’. The community acquires cattle that are nearing the end of their working lives and that would otherwise be slaughtered or abandoned. After the animals have died naturally, the carcasses are skinned (the hides provide an important income) and fed to the vultures. Since the Vulture Safe Zone was established there has been a steady increase in the number of vultures visiting the feeding stations and flocks of over 150 birds are not uncommon. There has also been a significant increase in the number of nesting White-rumped Vulture at nearby colonies (see figure), although as yet there has been no improvement in the nesting success of other vulture species. In addition, a viewing area has been created overlooking the feeding area which has helped generate tourism revenue for the community. The project also promotes local livelihood activities including bee keeping and organic farming and runs educational events raising awareness of the socio-economic value of vultures and the damage done by diclofenac. Vulture Safe Zones have since been established elsewhere in Nepal—for example, near to the Lumbini farmland IBA in Rupandihi district and adjacent to Dang Deukhuri Forest IBA in Dang district. BCN’s vulture conservation programme has provided a highly successful model for community-based conservation of threatened species. The extension of this approach to other parts of the country is now a fundamental component of the Nepalese Government’s five year Vulture Conservation Action Plan launched in February 2010. Gilbert, M., Watson, R. T., Ahmed, S., Asim, M. and Johnson, J. A. (2007) Vulture restaurants and their role in reducing diclofenac exposure in Asian vultures. Bird Conserv. Int. 17: 63–77. Green, R. E., Newton, I., Shultz, S., Cunningham, A. A., Gilbert, M., Pain, D. J. and Prakash, V. (2004) Diclofenac poisoning as a cause of vulture population declines across the Indian subcontinent. J. Appl. Ecol. 41: 793–800. Oaks, J. L., Gilbert, M., Virani, M. Z., Watson, R. T., Meteyer, C. U., Rideout, B. A., Shivaprasad, H. L., Ahmed, S., Chaudhry, M. J. I., Arshad, M., Mahmood, S., Ali, A. and Khan, A. A. (2004) Diclofenac residues as the cause of vulture population declines in Pakistan. Nature 427: 630–633. Shultz, S., Baral, H. S., Charman, S., Cunningham, A. A., Das, D., Ghalsasi, G. R., Goudar, M. S., Green, R. E., Jones, A., Nighot, P., Pain, D. J. and Prakash, V. (2004) Diclofenac poisoning is widespread in declining vulture populations across the Indian subcontinent. Proc. R. Soc. Lond. B. 271(Suppl. 6): S458–S460. Swan, G., Naidoo, V., Cuthbert, R., Green, R. E., Pain, D. J., Swarup, D., Prakash, V., Taggart, M., Bekker, L., Das, D., Diekmann, J., Diekmann, M., Killian, E., Meharg, A., Patra, R. C., Saini, M. and Wolter, K. (2006) Removing the threat of diclofenac to critically endangered Asian vultures. PLoS Biology 43: 395–402.